I've been past this ancient, old-growth hemlock many times. Somehow, I never thought about the tree being hundreds of years old, and that it witnessed a tragic event in 1864. The hemlock tree can't tell me whether it was one of the trees on which bodies were found. On September 10, 1864, the Westmoreland (a 4-4-0 Bury boiler steam locomotive) had just left the sawmill and was pulling the gentle grade out 'Scootac with 4 people on board the locomotive. This hemlock tree stood between the two railroad grades... the ill-fated locomotive was on the upper one, just out of sight to the right in the picture below. About half past 10 o'clock, and about a mile from the sawmill, the locomotive boiler exploded. No one survived to give any details. I'll spare you the gory details from the newspaper accounts of the aftermath. I will say that the accounts give indication of shrapnel. There's a real good chance the locomotive, La Copiapo is a sister engine (same year, same builder) to the Westmoreland, so click here, here ,or here for a better idea of exactly how the engine looked. Here is a photo of a model of a similar engine. Well, one with a Bury boiler. Here is a photo of a boiler fragment from the Westmoreland. 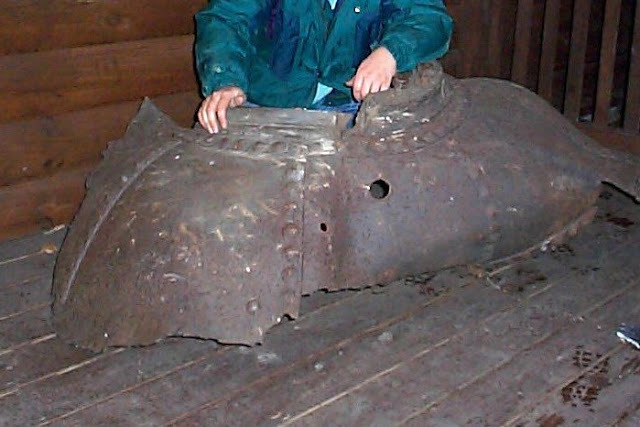 It was found on the mountainside across the valley from the locomotive explosion. Unfortunately, that's one way to have a boiler end up as shrapnel. About a hundred yards or so from the spot where the boiler fragment landed there are some more old-growth hemlock trees. These hemlocks have a certain ancient look... rugged, scruffy, craggy. This photo is looking past one old-growth hemlock toward the locomotive boiler explosion site. Until recently I didn't think about the trees that were in the way of flying debris from the boiler explosion. In light of the fact that I've found pieces of the locomotive boiler clear on the other side of the valley, I wonder how many trees intercepted shrapnel? I'd love to piece together the story of the Westmoreland. Since it happened almost one hundred and fifty years ago, there's not much to go on. I realized I might find some clues when I saw the tree rings... a record of a long history. Perhaps the hemlock has wounds from locomotive explosion... perhaps it bears silent record of that accident... If the tree does, I haven't seen it yet...but, I'm still looking. If only this tree could talk. At any rate, it's a historical tree and that's how I get to weave some history into a nature website. And, yes I've often thought of the many, many stories we would hear if a lot of things could talk. Wow Dana. And to think that the boiler explosion could claim another victim 150 years later as someone cutting into a tree might just hit that shrapnel ! Interesting post. I saw this tree come down and it is sad to see something that has been around that long come crashing down. I'm sure it has many more interesting stories to tell. Thanks for sharing! Thanks for commenting. I'm always interested in hearing more "stories from the Scootac"! Sometime I should show you the boiler fragment.